This project assists young people with behavioural problems to develop new attitudes to learning and society with a workshop helping them to create a circus programm. Parents and other voluntary helpers assist by providing equipment and their time. Ten children and adolescents, with past difficulties at school or socially, have had the opportunity to develop new and positive attitudes to learning. A six-month workshop, relying on volunteers (including their parents) and community workers, has helped create a circus act that is set for a four-week tour this summer. The programme – covering theoretical, creative, artistic, and hands-on learning – has helped them regain responsibility for their lives. The Association behind the project is very successful, and intends to strengthen and expand its Circus work. New buildings will be built, and existing buildings refurbished, so as to increase the available places from 10 to 16, and create 4 new jobs and more volunteer posts. Three new seminar rooms will allow increased co-operation with local schools and childcare nurseries. Using land made available by the municipality, a new energy-efficient building – shaped like circus tents - will be constructed, with seminar rooms, a kitchen, living and dining areas, a rehearsal room and a stage. Part of the labour will be provided by 90 volunteers over 6 weeks in the summer. The increased intake of students – up from 10 to 16 - will require 6 new circus trailers for accommodation. The existing circus tent is 14 years old and too small, so will also be replaced. Increased sponsorship will enable the Association to accommodate and support more children and adolescents with behavioural problems. The infrastructure is in place and the land has been acquired on which to build a new rehearsal and seminar building. A new circus tent and 6 more trailers will allow the summer tour to take place. Four new full-time jobs will be created in this rural area. This project is funded both under the Quality of Life measure 413, and 322 on Village Renewable/Development. This youth project is unique within Germany. It has an almost 100% success rate, showing that it is possible to work effectively with adolescents and children with behavioural problems. 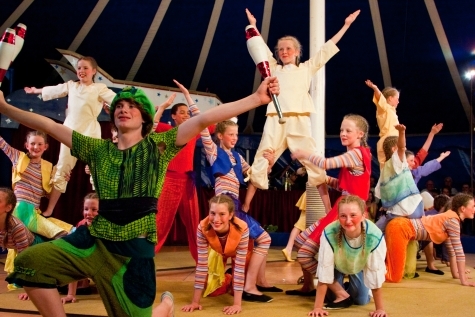 Working with the circus is a modern experimental teaching practice. Combined with its social aspect, this is a truly pioneering project with further expansion already planned.